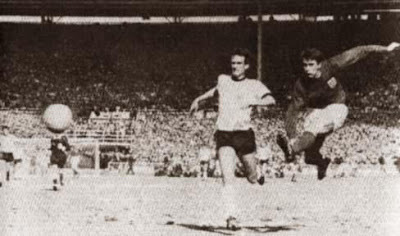 Geoff Hurst scores his third goal to seal victory for England over West Germany in the 1966 World Cup Final. Football has a history of adopting classical music themes. So the just-republished and much-praised Directory of Classical Themes should be a best-seller on the terraces. I listened to the 1966 World Cup final on a transistor radio on a train returning from a school trip to Austria. That trip introduced me to the art and music of Vienna. How sad that educational travel has become a victim of our Health and Safety culture. My school was Glyn County Grammar in Epsom. One of the school's more celebrated pupils was David Hemmings who, in those heady pre-Health and Safety days, shared some champagne moments with Benjamin Britten.